One of the most important things my mama instilled in me growing up was to be graceful and grateful. Now that I’m going to be a mommy too, I plan on passing along the message to my child. 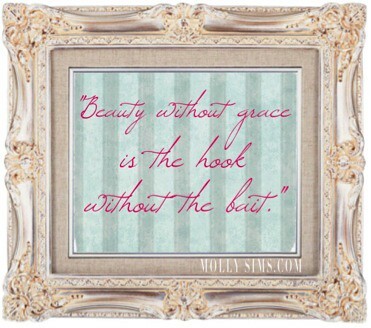 Beauty you’re just born with, but it’s nothing without grace and grace is something you’ve got to work at! I love this quote by Ralph Waldo Emerson. I think every woman should print this out and stick it by her vanity mirror. What does grace mean to you? Ask Me Your Beauty Questions!